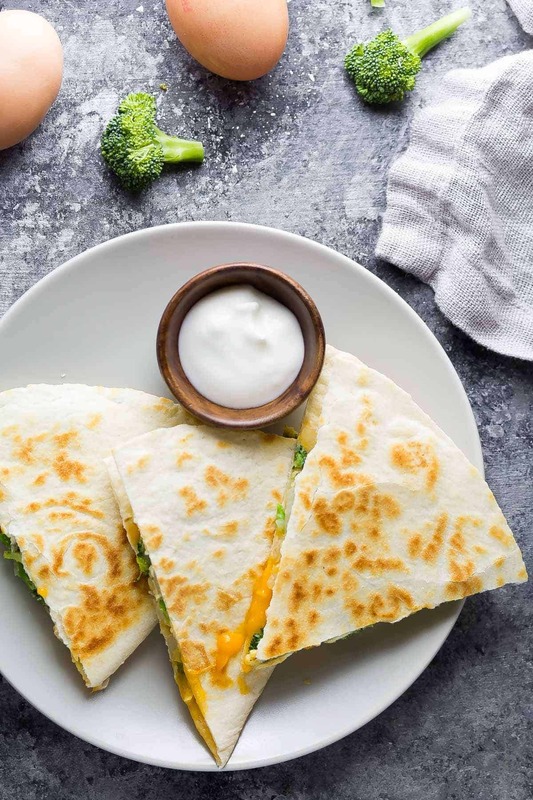 Broccoli cheddar breakfast quesadillas are a great alternate to breakfast burritos…crispy, cheesy, and sneakily full of vegetables. Stock up the freezer for easy breakfasts. We had a glorious holiday in Tofino last week, full of fresh air, great food, sandy beaches, and sleep ins. Kai was surrounded by lots of family and he LOVED all the attention. He managed to rally all the relatives into a giant hug circle (with him in the middle), and named it ‘hugga hugga’. He’d say ‘Let’s hugga hugga everyone!’ and we’d all have a giant hugga hugga circle. Hilarious! Well, we returned home to a completely empty fridge, no bread, milk, eggs, fruit or veggies. HOWEVER. 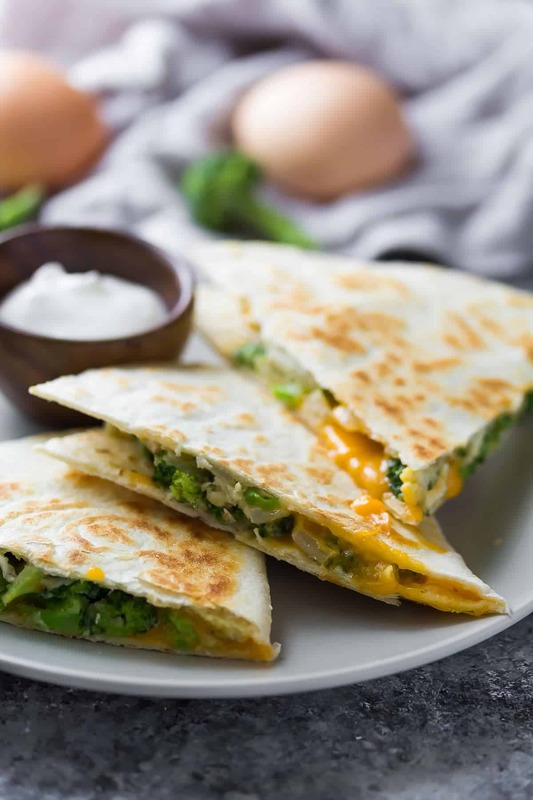 I did have a freezer stocked full of breakfast food, including these delicious broccoli cheddar breakfast quesadillas, so we did not go hungry! 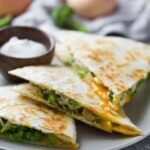 One of my favorite recipes on this site are the freezer-freindly Spinach, Feta and Egg Breakfast Quesadillas. I know everyone loves breakfast burritos, but in my humble opinion, you can’t beat the crispy texture that a breakfast quesadilla gets, even after freeze/thawing! So I thought it was time to come up with another variation. Freezer-friendly breakfasts are an absolute lifesaver for me. I am a chronic morning zombie, and often will skip breakfast, then get hangry and grab something not so healthy. Since I started doing breakfast meal prep, the mornings have become SO much easier! I get a healthy (and tasty) breakfast, my energy stays up through the morning, and it motivates me to make better food choices later in the day. It really sets off a healthy-eating chain reaction. The surprising thing about meal prep is that it’s actually fun! I thought it would be such a chore, but I watch a really bad movie or crank up the music while I do it, then post a picture on my Instagram after, and the whole process is really quite enjoyable. or check out this round-up of 28 Healthy Breakfast Meal Prep Ideas for even more ideas! 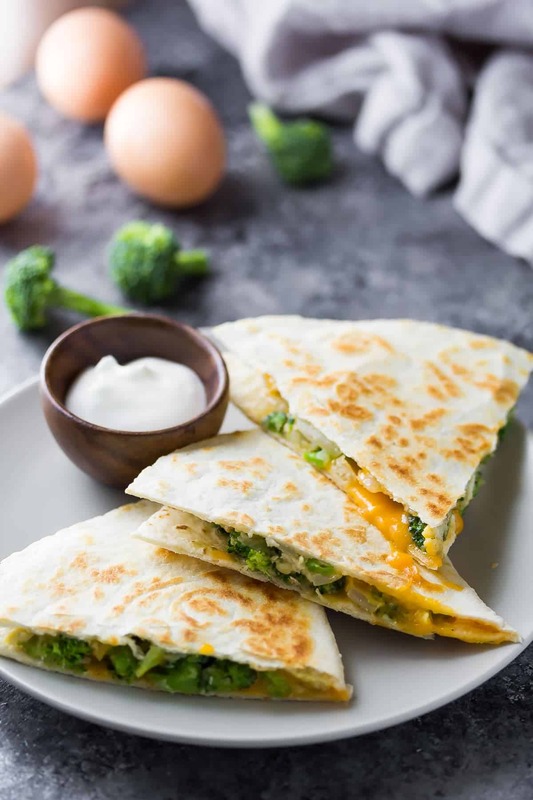 Broccoli cheddar breakfast quesadillas are a great alternate to breakfast burritos...crispy, cheesy, and sneakily full of vegetables. 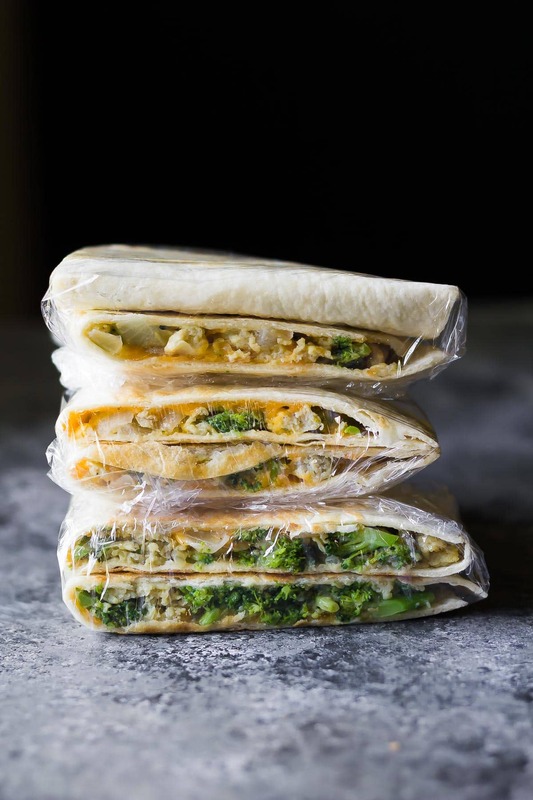 Stock up the freezer for easy breakfasts. Heat a large pan over medium heat. Add the oil and the onion, and cook for 5 or so minutes, until onion is cooked through. Add the broccoli and cook for 5 more minutes, until bright green and tender. While cooking the veggies, beat the eggs with the salt and pepper. Add to the pan and cook, stirring frequently, for 2-3 minutes, until eggs are cooked through. Remove from heat and allow to cool slightly. In a clean pan, assemble quesadillas: on half of the tortilla, add ⅔ cup of egg mixture, topped with ⅓ cup cheddar cheese. Fold the tortilla over on itself and press firmly. Cook for 2-3 minutes per side until golden and crispy. Remove from heat and cool completely on a wire rack. Storage InstructionsCut each quesadilla in half and stack each serving. Wrap tightly in plastic wrap, then place in a large ziplock bag. Keeps in the fridge for up to 3 days and in the freezer for up to 3 months. Re-heating InstructionsThaw overnight in the fridge (if frozen), or in 30 second increments in the microwave. Heat in a frying pan over medium heat 3-4 minutes per side, or in a George Foreman Grill for 2-3 minutes total. Looks great! What’s the white dip next to it? Cream cheese, yogurt, mayo? Love starting off the day with a little fiesta! These looks SO good, and so perfect for an on-the-go breakfast that isn’t all carbs and sugar. Need to try these! Thank you so much for this! I love cooked veggies and sometimes get tired of frittatas in the morning. I didn’t even think of a veggie quesadilla! Haha! Kai is adorable! 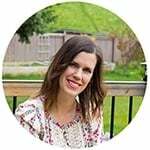 I love the idea of eating quesadillas for breakfast and I think my husband will thank you for this recipe 🙂 Also, now that I have Eli I can fully appreciate make ahead breakfasts like this! Sounds like you had a great vacation, Denise! I loved seeing your IG stories! And yay for freezer food! I love having a freezer stocked full of yummy things. 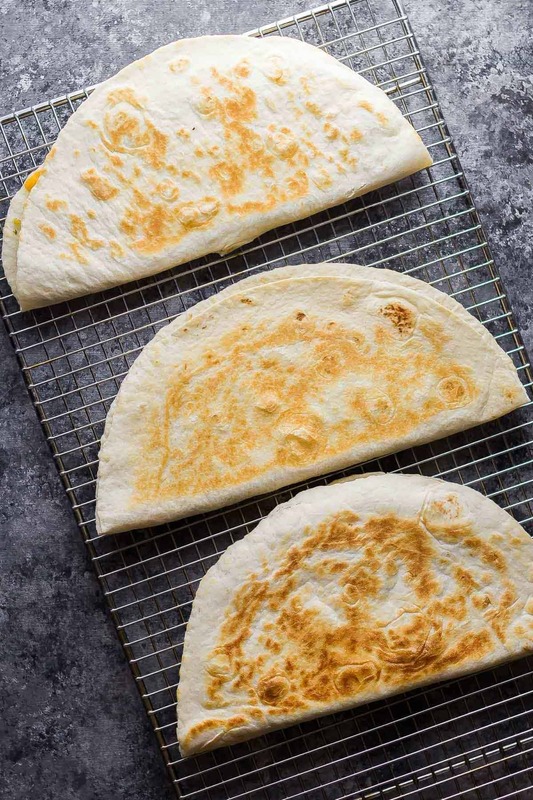 These quesadillas look like my perfect breakfast, lunch or dinner!